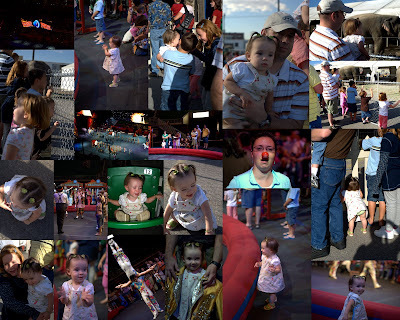 Yesterday morning we packed up Amelia and removed all concealed weapons from Justin to brave the circus. Melissa was so awesome to arrange everything for the Call side of the family. We arrived around 9:30 in order to see the animals in their pens before the show. Amelia was quite taken to see an elephant so close...the ones at the zoo were much further away. Melissa, Jonathon, Charity, Kenny, and Raquel (plus kids) all met up with us near the elephant enclosure. Once finished admiring the animals we made our way into the Delta Center (I know it has a new name) for the pre-show. I was shocked at the exorbitant prices of the programs, toys, food, and trinkets. Yikes! The programs alone were $15 per! We made our way to the floor where clowns and circus performers were showing off tricks. Justin didn't even punch a clown...I was sort of disappointed he did not go ballistic! He thinks clowns are psycho: grown men parading around in makeup and wigs, when it is said that way it does come off a bit perverse. Amelia thought all the lights, loud music, and clapping were awesome. She danced and clapped to her heart's content. The show started at 11:00. Our seats were near the very top of the auditorium so we could see everything. Amelia was very entertained for the first 20 minutes. She stood up, said, "All done" and made her way out. We still had 1.5 hours left. She finally succumbed into a fitful nap for a little while. I really enjoyed the elephants, motorcycle cage, and the trapeze artists. Miekka picked us up around 6 pm so we could carpool to Noelle and Kao's wedding reception in Ogden. My Lance grandparents and Uncle Scott were there. Scott did all the photography, and an awesome job. He had one huge canvas printed up of Noelle in the receiving hall that was amazing. I love to study other photographer's styles and try to figure out how the heck they ended up with such a great picture. I enjoyed chatting with Mary & Mel, Margaret & Jay, Alice & John, and Sally. We had one tuckered out girl by the end of the evening. Astonishingly, she did not fall asleep on the drive home. De-bo watched Amelia for us Friday evening. We snatched some dinner at Chipotle's then did a session at Jordan River Temple. A girl I used to work with at Woods Cross DWS sat right next to us with her new husband. Her name is Jerilyn. Then the witness couple happened to be the parents of Natalie, another coworker from the same office. I photographed her two boys a couple months ago. Small world! Taking our time in the temple was marvelous. I love the chance to sit back and enjoy the quiet nature of the spirit. Many thanks to De-bo. The rest of the week was spent in a flurry of activity. Miekka and I went to Macey's for their case lot sale. I spent $330 but felt it was justified since I will be gone for 5 weeks of Walmart trips. I also am working on passing out my photography fliers for the Christmas season. It takes about an hour to 1.5 hours per street. I still have three streets left. I finally cleaned and organized the basement. It is much more functional. Too bad I am such a messy crafter. LOL.